You can have your gift-wrapped charm right away! And you don't have to be charged extra! 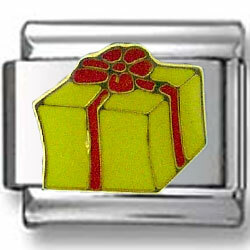 The shimmering face link of stainless steel encloses your yellow Gift Bow itself! Painted in bright yellow enamel and tied with red lace the box is outlined with gold enamel and is raised above a shiny support. Send it to your friend with a real birthday present or link to your own to safe the secret that is inside.